Based on Dr. William Gray's forecast, this year will endure an above-average hurricane season, which began on June 1 and will end on November 30. However, it is expected that it will be slightly less intense than the 2004 Season. It has been predicted that some 13 major events will occur, six of which would be tropical storms and at least seven would become hurricanes. Four of these would fall into categories 1 and 2 of the Saffir-Simpson scale, and three into categories 3-5. 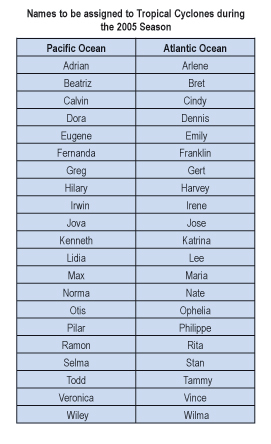 The analog years for the 2005 Hurricane Season -1952, 1959, 1995 and 2003- suggest that two tropical cyclones will develop in the Caribbean Sea during 2005. 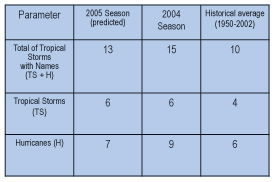 The following table shows some estimates for the 2005 Hurricane Season, in comparison to 2004.